Perhaps buoyed up by the success of Manchester Passion (broadcast live on Good Friday 2006) and this Christmas’ Liverpool Nativity, the BBC are once again embracing programming with a religious theme this Easter. This time, it’s not just an hour-long passion play, but a dramatic retelling of the longer Easter story and Jesus final days. 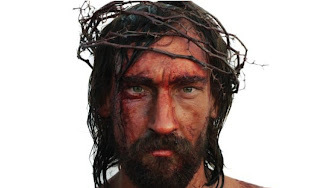 The Passion is the theological term used for the suffering – physical, spiritual, and mental – of Jesus in the hours prior to and including his trial and execution by crucifixion. You’ll be able to catch The Passion nightly on BBC One, starting on Palm Sunday (16 March) and finishing on Easter Sunday (23 March). Having finished the adaptation of Bleak House, and wanting another strong story to tell, producer Nigel Stafford-Clark had already been looking at previous passion productions and considering how to make a new one. 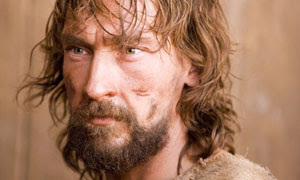 Hearing that the BBC were planning an Easter production based around Jesus, he successfully pitched to make a show that would reflect the motivations of all the central characters and not just Jesus. 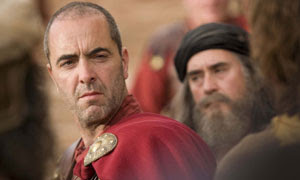 The cast includes Jesus (played by Joseph Mawle); disciples Matthew (Daniel Evans), Peter (Darren Morfitt) and Judas (Paul Nicholls); Pontius Pilate (Jimmy Nesbitt), his wife Claudia (Esther Hall); Barabbas (Stephen Graham), Joseph of Arimathea (David Oyelowo), Jesus’ mother Mary (Penelope Wilton), Mary Magdalene (Paloma Baeza); as well as High Priests and temple guards. Filmed in Morocco, the drama will start with Jesus’ entrance through Jerusalem’s East Gate on a donkey, and follow him through the week to his crucifixion and resurrection (or “its startling aftermath” as one press pack put it). While it’ll no doubt be dramatic and set through the eyes of those who wrote (Frank Deasy) and directed it (Michael Offer), The Passion does present a number of opportunities. At a personal level, it’s a chance to take a fresh and different look at the Easter story. To be educated about the complexities of the political and religious maelstrom of Jerusalem in 33AD, and to better understand the power plays and tensions that were in action that week. Like eight sermons in one! Whether or not everything on screen is perfectly accurate doesn’t really matter. Whoever retold a Bible story to a child and got it word (and meaning) perfect? The insight and challenge should come by looking at the story through the eyes of the Romans, the religious authorities as well as Jesus and his followers. As a teenager, I recall a set of daily readings (might even still be downstairs in the new bookcases) that looked each day at different people Jesus met in the run up to Easter. It was refreshing way to re-view the story, not following the strict storyline or one particular gospel, but weaving a path through the different accounts. At a community level, I think it’ll be good to bring the origins of the Easter holiday to the fore. Giving an opportunity for Christians to talk about their faith, to comment on the soap opera story that unfolds throughout the week. Some churches and organisations are going to great lengths to promote and use the series as a backdrop for their congregational activities. But even the very presence of The Passion in the media and on the box should stir up an awareness of God’s message of good news this Easter. Update - Thur 28 Feb - The series' consultant Mark Goodacre (Associate Professor of New Testament in the Religion Department at Duke University) is over in the UK for the series premiere and launch in London's West End tonight. 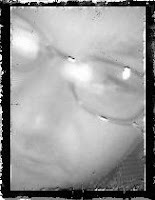 He's blogging about his experience ... via Ramblings from Red Rose. Update - Sun 2 Mar - reactions from the preview screening are appearing in the press along with background pieces: Guardian (twice), Times. 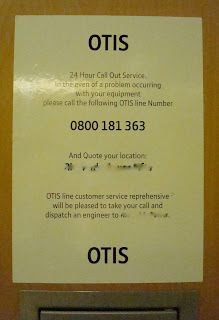 Aren't you glad that OTIS concentrate their efforts on lift maintenance, and not on spelling? Q: How many surrealists does it take to change a light bulb? A: Two. 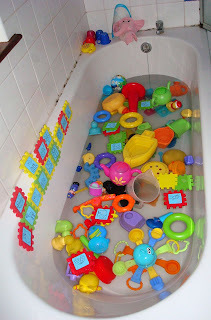 One to hold the giraffe, and the other to fill the bathtub with brightly coloured machine tools toys. Tomorrow night, St Pauls Cathedral will host a candle-lit vigil, a pedal-powered cinema (world premiering “fun and factual films”) and a welcome address by the Bishop of London who is backing Energy Saving Day (or E-Day, not eDay, for short). Between 6pm on Wednesday 27 through to 6pm on Thursday evening, the organisers are encouraging us to make a conscious effort to save energy in their home, school or workplace and report what they’ve cut down or eliminated on the E-Day website. Staging E-Day over 24 hours will help to minimise the risks associated with large swings in electricity demand, while allowing time for significant energy savings to be achieved. Given the number of non-essential household items that are left on, the widespread uptake of this call to action has the potential to result in a 1-3% drop in the UK’s electricity demand. National Grid has agreed to predict demand the day before E-Day happens and to help the public to access this information via the E-Day website once the countdown has finished. It will also manage any changes in electricity demand and refine its forecasts, used to determine the effectiveness of E-Day, based on the weather during E-Day, as well as any other unexpected news or television events. However, environmental expert Matt Prescott pressed ahead with the overall project, working under the banner of E-Day. So why not turn off those lights in unoccupied rooms, power bricks not actually charging anything, and gadgets sitting on standby and see if it makes a difference (or forms a habit you can sustain)? This is what happens when you write a blog post that mentions Dustin the Turkey ... followed by everyone going into work on Monday morning and searching for details online ... and Google listing your post in the "currently being blogged" section that can appear at the bottom of the search results. Normal service statistics will resume! This week sees the expansion of Aer Lingus’ routes from Belfast International and the basing of a third aircraft at the airport. And beginning 30 March, they’ll be flying daily to Paris Charles de Gaulle (achieved by cutting back on one of the current twice-daily flights to Amsterdam). Twice-a-week flights to Nice start on 1 April, making a total of ten destinations served from their new Belfast base. 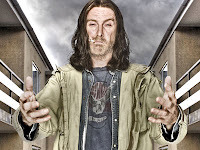 C4’s Tuesday offering of Shameless continues to produce more and more surreal episodes as the Gallagher family and their neighbours create mayhem in Chatsworth Estate. The violence and gang culture is largely gone, replaced with ludicrous yet fun storylines, each still told from one character’s perspective. 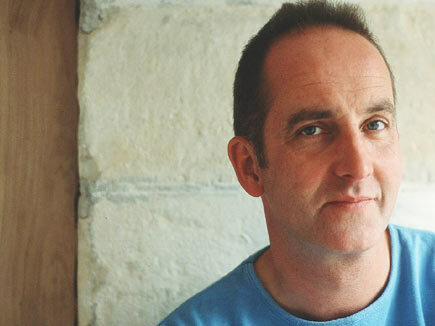 Sometimes I wonder whether the participants on Grand Designs have ever watched the show. Do they really believe that they’ll be able to successfully get past the foundations without being filmed pouring five pound notes into the yet-to-set concrete? Yet occasionally, someone pulls off the impossible, finishing nearly on time and only 10% over budget, creating a dwelling worthy of their time, money and attention. I only wish it was as entertaining to watch someone build a modest, low-cost house as it was watching people fritter away money they can’t always afford. With ever-increasing numbers of passengers passing through their terminals, Britain's airports are raking in huge profits - which are only set to get bigger as they seek expansion through extra runways or terminals. But matching the increase in passenger numbers is the threat from terrorism and concerns about the environment. The foiled terrorist attacks at London Heathrow and Glasgow airports have seen an unprecedented heightening of security at Britain's airports. But how effective are these new Government-imposed measures? Dispatches reveals how the current restrictions on fluid would not prevent terrorists detonating a liquid bomb and questions whether the focus on weapon-seeking technology and body-searches at security gates is the most effective way of preventing breaches. Gilligan meets a security expert who criticises the way in which security processes have simply played catch-up with terrorist attempts over the years instead of proactively seeking new means of prevention. As a child, after a fumbling start in P1, I took to reading and have had my nose stuck in a book ever since. Travelling in the back of the car, I saw looking out the car window as a lost opportunity to read another few pages of whatever fiction I was holding. Like most in my generation, I went through a fairly extensive Enid Blyton phase, with The Secret Seven, The Famous Five, The Magic Faraway Tree and various other tomes weighing down a bedroom bookshelf. I can still remember lying on the floor reading Five on Finniston Farm (it had a blue cover) as an emotional distraction the morning that my cousin was flying back to America after visiting NI for a few weeks. But it was one of the less-renowned Secret series that to this day is easily the book that I’ve read cover to cover most. As a youngster, I must have read it 30 or more times. In my early teens, I flogged my childhood books to a long-defunct Lisburn second-hand bookshop to raise a paltry sum to help buy peripherals for a ZX Spectrum! (Learnt my lesson about throwing out books that time.) So when I found it on Amazon one day, I couldn’t help but order a copy to rediscover my childhood favourite. 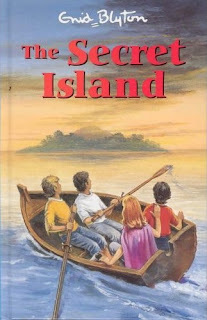 The Secret Island describes three siblings who had moved in with their Aunt and Uncle while their adventurous parents flew to the southern hemisphere. But two years later, they were still billeted and very unhappy with their treatment. Led on my Jack who lived and worked on his grandfather’s neighbouring farm, they plan to collect together enough provisions (now there’s a very Enid Blyton word) and row across the lake to an uninhabited island. And so they do. Nora, Peggy, Mike and Jack become a regular Swiss Family Robinson (another childhood book – bought it together with Robinson Crusoe in a sale in Anderson and McAuley), constructing a house from willow trees in the wood and planting vegetables. Running low on supplies, they make various forays back to the mainland, eventually bringing back a sackful of hens and towing a cow behind the row boat as a supply of fresh milk. Jack’s the leader, full of practical know how and ideas. Mike’s thorough and a good second-in-command, but doesn’t come up with many original ideas on his own. The girls make tea, sew, cry and get things wrong. Peggy’s the more reliable of the two, acting out the mother role on the island. While little Nora’s the youngest and most fragile. But the pair of them act as doormats for the boys, obeying their command and lapping up the occasional praise for doing a job well. They all live happily ever after, with the three children reunited with their parents, Jack casually adopted, and the Aunt and Uncle scolded for their lack of care. Not a social worker in sight! Re-reading the book makes me realise how much society has changed. As a child, I remember that some parents refused to allow their kids to read Enid Blyton, citing poor quality writing. These days, it would be the content that would face the criticism. To portray boys and girls in such stereotyped ways would cause an outcry. Nobody takes the Eurovision Song Contest too seriously ... until a ludicrous act wins the final, or wins a country’s contest for their entry. And so the knives have come out (post-Christmas) for Dustin the Turkey who beat off five other acts to win his place as Ireland’s entry into the 2008 contest. 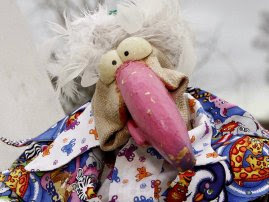 Whether or not the European voting public will take kindly to the puppet and his song Irelande, Douze Pointe that takes the contest less than seriously remains to be seen. However, the Europe-wide storm of publicity after Saturday night’s decision by the Irish phone voters and texters can only help Dustin chances in May. Proves too that the Irish still have a sense of humour! as the BBC online report described it! What knows how to write a song. Oh Europe, where oh where did it all go wrong? Do you like Irish stew? Or goulash as it is to you? Back at the beginning of December, Cyber Scribe (of Cyberscroll fame) sent out a questionnaire to some local NI bloggers. Two and a bit months on, and a house move later, he’s published my responses to his questions. So if you’re nosey about some of the background to AiB, check it out. Business continuity in the 21st century normally means that organisations try not to disrupt customer service. Sometimes the consequences of hiding complex IT upgrades from customers means that in the background engineers are doing something not unlike changing an aircraft engine mid-flight. Stealthy changes take time. Witness the slowly, slowly incremental approach taken with the M1/Westlink improvements in Belfast, where a chess game of lane closures is being played out over two or so years that prevent the motorway (hardly) ever being closed, but add a lot of time to the end date. But it’ll be no surprise that Ryanair haven’t taken this approach to migrating to a new airline reservation system this weekend. They’re taking down most of the aspects of their website and call centre for the weekend. A total outage. No new bookings. No changes to bookings. No online check-in. All flights between 22:00 hrs on the 22nd February until 23:00hrs on the 25th February 2008 will operate as normal. 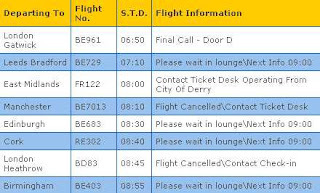 However flight date/name/route changes on these days cannot be made from 0100hrs (GMT) on the 22 February 2008 on Ryanair.com, at a Ryanair call centre or at the airport. Flight Changes (date/route/name) cannot be made on Ryanair.com or via a Ryanair call centre between 22:00hrs on the 22nd February until 23:00hrs on the 25th February 2008 .
Review Existing Booking - passengers will not be able to review their existing booking details on Ryanair.com or via a Ryanair call centre between 22:00hrs on the 22nd February until 23:00hrs on the 25th February 2008. Rather than eek out the changes over a period of weeks or months, they’ve gone for the big bang approach, complete with three day outage. Speculation - supported by the Office of Fair Trading - is that the timing of the upgrade is linked to Ryanair’s continued failure to meet a deadline to list fares inclusive of all fixed non-optional costs (including taxes) on its website. Eleven of the thirteen airlines ordered to amend their online booking systems met the original deadline, while two (Aer Lingus and Ryanair) asked for extra time. Aer Lingus met their new deadline, but Ryanair didn’t. The urgency to make the switch to the new reservation system - and the tolerance of substantial website and call centre downtime - seems to be a necessary evil to avoid further measures or even fines being levied by the OFT. Surprisingly The Register hasn’t had anything to say on the matter! Nowadays it would be deemed politically incorrect to thump moles over the head with a hammer ... even if it is a plastic mole and a plastic hammer. But after the dodgems, Whac-a-Mole (apparently there's not a "k" in Whack) it was probably the most satisfying aspect of a visit to a Portrush amusement arcade when spending a weekend up on the North Coast. Physical exertion combined with mental concentration. Fun. Well now you can do it at your desk. Without the hammer. And without the physical exertion. Bit rubbish really. 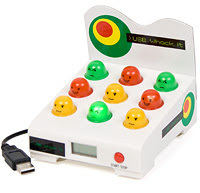 But the firms who make a fortune churning out pointless gizmos that can be powered from your computer’s USB port have created the USB Whack It. Uses your finger. Would be far more fun with a big hammer! Every new year, following all the festive specials, TV channels serve up a selection of winter dramas to keep our interest in the box in the corner on the long cold evenings. For a change, ITV seem to be having some success. After the frustration of a series I liked being cancelled mid-series (despite all the episodes having been completed) – Making Waves which sank without trace – I was slightly reluctant to engage with this year’s fare. On Monday nights The Palace is a mischievously light-hearted comedy drama, starting with the pretext of the King dying and the sudden coronation of his eldest son Richard. Young, brash, but not quite as drunken as his younger brother George, his new role is proving a stretch for the new monarch. Plenty of upset loyalties, a bit West Wing but with a lot more “downstairs” views of life serving in the palace, and not just the “upstairs” world-changing decisions. It would be a shame if viewing figures dropped off and it was cancelled. But it’s probably not worth a second series. Sticking with ITV, the pretend behind-the-scenes Moving Wallpaper started strongly, and is still keeping ahead of the less than engaging soap Echo Beach that follows it on Friday nights. (Well actually, more likely to pick this up on ITV Catch Up as there’s no way you’d be bothered watching it live.) An interesting twist on Drop the Dead Donkey, but with both shows so tightly tied together, but only one swimming, I predict Echo Beach pulls Moving Wallpaper underwater and they pair don’t resurface. Such a pity that Primeval on Saturday evenings can now be summed up in one word: awful. Gave it a second chance, but it's truly woeful. Time to fall into its own anomaly, despite the good international sales. ITV1 crime show Rebus has been axed - and talks are under way over whether a number of the commercial broadcaster's new - and underperforming - drama series will return. ITV executives have been holding talks this week with the producers of a slate of new ITV1 dramas launched last month which have failed to pull in big ratings, including the Amanda Redman series Honest, royal drama The Palace and the linked comedy Moving Wallpaper and soap Echo Beach. It is understood no decisions have been taken on whether the series will return, although not all of them are expected to survive. Honest, which pulled in 4 million viewers for its final episode last week, is thought to be the most likely to return as it attracted the best results on the audience appreciation – or AI - index. The Tony Jordan-penned comedy Moving Wallpaper, which attracted 2.4 million viewers last week, and its linked soap Echo Beach, which dipped to a low of 1.9 million on Friday, are not expected to return. The ITV spokeswoman added: "As many of this year's 9pm dramas are still on air no decisions have yet been made on recommissions. Despite this uncertainty, a ten episode dose of Taggart has been commissioned for transmission at the end of 2008. Update - 10 April - The Palace has not been recommissioned, and Media Guardian hints that Echo Beach will return beside the already confirmed Moving Wallpaper. 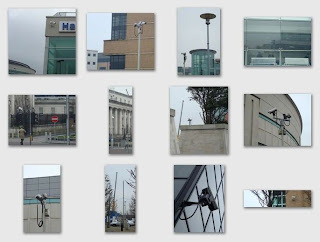 Waterfront cameras - too many? too few? The area around the Waterfront Hall and Lanyon Place has been in the news the last couple of weekends for all the wrong reasons. 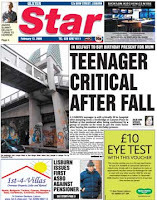 First there was the violent confrontation on the bridge (the one that leads from the Hilton across to East Bridge Street) which resulted in a teenager jumping over the side of the bridge to escape, and sustaining serious injuries from the long fall. Then last weekend came the news report of a fourteen year old girl who was raped in the Waterfront area. An area surrounded by paved pedestrian walkways, whether along the banks of the Lagan or in front of the concert hall. Restaurants opening. Foundations of more buildings been dug and concrete poured. Covered with cameras. Yet still an unsafe place to be at night. No cameras actually covering the length of the bridge. But would the addition of more cameras actually make the area any safer? 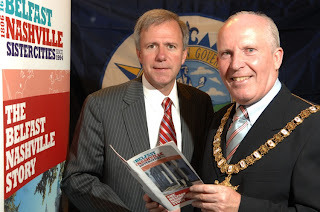 There’s even a joint publication – The Belfast Nashville Story - written in 2007 as Nashville celebrated its 200th anniversary of incorporation, highlighting the cultural aspects that Belfast and Nashville share together with the role played by the many “Ulster Scots emigrants and their descendents”. Even less talked about than the special relationship between Nashville and Belfast is Nashville’s promiscuity ... it hasn’t just signed up in union with Belfast, but has relationships with Edmonton (Alberta; Canada), Caen (Basse-Normandie, France), Pernik (Bulgaria), Magdeburg (Germany) and Taiyuan (Shanxi, China). Though on closer inspection, Belfast has a fair few sister cities too: Belfast (Maine US), Bonn (Germany) and Hefei (China). But putting all that behind us, the 4th Belfast Nashville Songwriters’ Festival kicks off tomorrow. And as if timed to coincide with and reinforce the Belfast-Nashville connection, one-time Belfast flâneur Jett Loe has finally uploaded the long-awaited Chapter 78 of Letter to America podcast, recorded in his new home of Nashville. It’s really bad when it’s so cold outside that you need to scrape the inside of your windscreen because it has iced up ... hence the white dandruff scattered across the dashboard. A good thick coating ... after five minutes the car’s air blower hadn’t made much of a dent in it. After last week’s fogginess that badly affected flights in and out of Belfast City Airport, I asked the airport if they’d any plans for CAT III instrument landing facilities ... no reply yet. 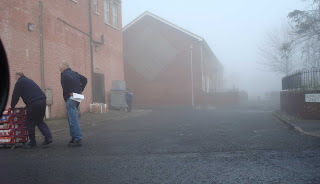 But this morning, the heavy fog over Belfast has once again caused major disruption over at St Georges. The early morning arrival from Heathrow diverted to Belfast International (Aldergrove). Ryanair’s flight from East Midlands diverted to their base in City of Derry ... quite a bus journey if you want to get your car out of the car park! Departures aren’t looking good ... though the Flybe to Gatwick is about to leave a mere two hours late. Up at Belfast International, the fog is having much less impact with only the bmibaby arrival from East Midlands badly delayed. 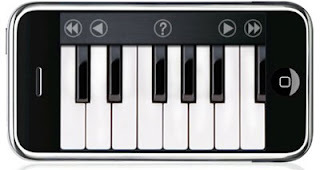 What happens if you set a piano on top of your iPhone? For a while, iPhones were quite a rarity in the UK. But over the last few weeks, lots more people seem to be digging deep into their pockets to shell out for the mobile phone of the moment that comes with the monthly call rental package that should brokered through a mortgage advisor rather than over the counter in Carphone Warehouse or the O2 shop. So if you want to make your iPhone stand out from all the other ones, you’ll want to download and install iAno on your unlocked handset. Now you can play Chopsticks anytime you want. And if you’ve got two iPhones, then you stand a chance of playing something with both hands! May also work on iPod Touch too. When you’re sixteen, there are a lot of things about life you don’t know to be scared of. Lots of adult experiences and situations look simpler than they really are. Naivety leads to a happy-go-lucky approach to life, that can be both a blessing and a hindrance. When the third pregnancy test stick turns pink, Juno (played by Ellen Page) has the proof that she really is pregnant, the result of single encounter with her geeky friend and high school runner Paulie Bleeker (Michael Cera). Surrounded by giggly peers, and parents that were hoping that she’d been expelled or had a drug problem rather than expecting, she takes matters into her own hands. Like 4 Months, 3 Weeks & 2 Days, abortion is her first thought. But the tone of the clinic – and the thought that her foetus might already have fingernails – brings her to a second idea: adoption. Juno wholeheartedly switches from termination to going full term with hardly a second thought, But befitting a young woman with a sense of value, she’s not going to allow just anyone to adopt her child. Impressed with one young professional couple’s small-ad, she goes along with her Dad to check them out in person. She finds a desperate childless wife Vanessa (played by Jennifer Garner) and a more reluctant husband Mark (Jason Bateman). Perhaps unconventionally for an adoption in which she has agreed to play no part once the baby is born, Juno keeps the prospective adopters up-to-date with progress and scans, and discovers that she has much in common with Mark, sharing taste in slasher movies and punk rock music. There’s a great scene where Vanessa is trying to choose between two swatches of yellow paint for the nursery wall. True to form, Mark’s unenthusiastic, though in this instance, who can blame him given that the choice is between custard and cheesecake shades? My fascination with this often comical film comes from the unexpected paths it travels. Young school girl pregnant is hardly an original starting point for a film. Yet the plot largely avoids the schmaltzy cul-de-sacs that happy-ever-after endings that a lesser movie would have portrayed. Instead, Juno continues to deal with each new twist and turn as an innocent sixteen year old might, maturing as she grows into a “cautionary whale”, but continuing to rely on herself. There’s a sadness too about the lack of joy in the film. A lack of longing for the baby growing inside Juno (by anyone other than the slightly freaky Vanessa), and a lack of anticipation and yearning in the matter-of-fact way Juno deals with the biology of the situation. Some of that’s part of the teenage world the film depicts ... along with Juno’s sharp wit, lip and thick sarcasm. Juno is a beautifully shot film, with original devices like breaking the story up into seasons, and the “anonymous Greek chorus of high school runners who appear” whenever Bleeker goes out running in his tiny gold shorts. The film’s shortness allows it to remain quirky without descent into tedium. The hamburger phone is fun. The music brilliantly fits the cast and locations. And if the Strand Cinema’s projectionist hadn’t switched off the projector half way through the credits I might have discovered on the night who had written and sung the songs. But true to the Strand’s pattern over the last few visits, staying on in your seat to watch the credits and mull over the film isn’t encouraged. Arghh. And it turns out that Juno has no relation to Irish playwright Sean O’Casey’s Juno and the Paycock. Though like Captain Jack Boyle, Juno’s “worl’s in a terrible state o’ chassis” too. How big’s the newsroom of the newspaper you read? You could count the number of people who work for the average provincial newspaper (eg, Lisburn’s Ulster Star) on your fingers. Granted, there are more people involved contributing columns and free articles and running the printing presses. But their Christmas party wouldn’t a particularly big venue. Scale that up to a UK national newspaper. My (uninformed) gut feeling is that there would be a couple of hundred working on the main paper - must take three or four people to write the material on a page, and not all work every day - and perhaps the same again on the multiple pullouts and specialist sections published throughout the week. Bill Keller, the paper's executive editor, told staff yesterday that the title had its highest ever headcount, and that cuts would have to be made through contract buyouts, attrition and some lay-offs. Despite some cutbacks at the title, editorial numbers have risen as the paper recruited heavily for its internet operation in recent years. But growing financial concerns, including a 4.7% drop in advertising revenue for the New York Times Company last year, have fuelled the decision to cut staff. Shares in the company rose nearly 5% after the announcement. The New York Times' own website reported that the paper's editorial budget is around $200m (£102m), of which about $3m is spent on coverage of Iraq. An extended US presidential campaign has also pushed editorial costs up. Wonder what the comparative figures would be for Times, Telegraph, Guardian, Independent and FT? Bet the Indy’s the smallest of the lot? And what about the Irish News, Newsletter, Belfast Telegraph, Irish Times? Update - Thu 6 Mar - Victoria Square's now open. 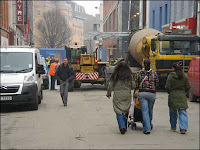 Yesterday, news reports told the story of lots of parking tickets being issued to vehicles belonging to contractors working on the new Victoria Square centre but parked on the surrounding pedestrianised streets of Belfast. Today, Ann Street and Cormarket were noticeably clear of vans, pickup trucks and cars – with lots of them squeezed into alley ways and even behind boarded up shop fronts within the cordoned off building area. Wonder how long the inconvenience of parking like that will continue – particularly with fairly tight deadlines to get Victoria Square fitted out and open in March 2008. But today there was another big change on site. A fountain arrived. Not a new one. 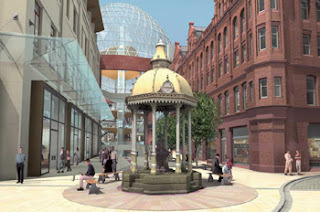 The Jaffe Fountain began life in the 1870s in Victoria Square, Belfast. It was moved out of the city centre and up to Botanic Gardens in 1993. Update - actually might have moved up in the early 1980s. Or maybe 1933? But today it was returned back to its home in Victoria Square. And there's another one the same in Limerick. 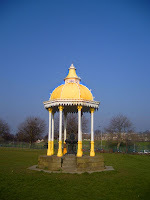 The fountain was made in 1874 by George Smith & Company at the Sun Foundry in Glasgow. It was first sited in Victoria Square before being moved to Botanic Gardens. There was some sadness to see it leave south Belfast but on the other hand it will be better in its original location at Victoria Square with the many thousands of visitors and shoppers every week being able to see it. It is a great link to Belfast’s history and the role of the Jaffe family. Daniel Joseph Jaffe was born in Mecklenburg, Schwerin, northern Germany on August 19, 1809. He laid the foundation stone of the synagogue in Great Victoria Street. He died in Nice on January 21, 1874, and was buried in the Jewish plot at Belfast Cemetery. Daniel Joseph’s son, Otto Jaffe, was elected as a city councillor in 1894, and was elected as Belfast’s first Lord Mayor in 1899 (the first incumbent of the title ‘Lord’). He was knighted after his first term and re-elected as Lord Mayor in 1904. Sir Otto died in 1929, and was cremated in London. And here's what it will look like when all the fencing and constructional dross is moved away. 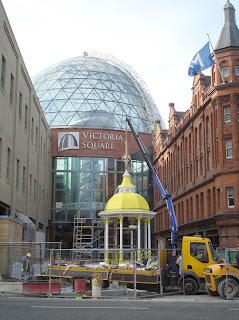 And check out Gerry Ward's photo of how the fountain originally looked in Victoria Square and the discussion over on Belfast Forum. Update - Friday 29 Feb - Belfast Telegraph ran an article about the restored fountain (complete with a photo). Parts of East Belfast went dark last night about 4.25pm. I’d made it through the turnstile into the work car park just before most of the lights suddenly went out. And while the card reader on the car park exit was wired up to the assured supply, the actual barrier wasn’t. But since no one else could get into the car park through the turnstile, only three cars queued up at the barrier wondering whether the power problems were more widespread that our concrete bunker. Northern Ireland Electricity today warned contractors to dig with caution or pay the price. The stark warning follows an incident in the Rochester Drive area of East Belfast last night (Wednesday 13th February) when 5,000 customers lost electricity supplies after a contractor, working on the water network, hit and damaged a high voltage transmission cable. The incident occurred at 4.25pm, affecting electricity supplies to properties and traffic signals in the area. NIE emergency crews responded immediately, restoring all customers to power within half an hour. NIE engineers and emergency crews worked through the night to uncover the extent of the damage and NIE Safety and Risk Manager, Roy Coulter, says the repairs could take weeks to complete. The effect was quite widespread, with the Hilton Hotel affected and some folk temporarily trapped in lifts. Our car park shutters were already up, so bikes and mopeds could squeeze out. And eventually when someone touched the entrance barrier’s arm, it swung up and the cars escaped too before the power came back on. "The difference between wisdom and knowledge is that knowledge consists of knowing that tomato is a fruit. Wisdom is not putting it in a fruit salad." Miles Kington, columnist for The Independent who died recently. I'd like to be able to tell you all about the launch of David Park's new novel The Truth Commissioner at Belfast's Linen Hall Library tonight. But I can't. 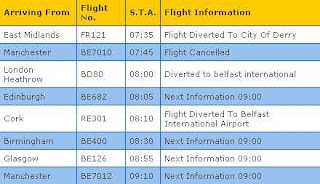 Some flights due to take off during the day were cancelled, and others coming in from Heathrow diverted to Aldergrove Belfast International as Belfast City Airport has neither a long enough runway nor the required Cat III instrument landing system to get down in very poor visibility. So tonight, the expected touchdown of BD90 at 19:00 (which would have got me to the event just fashionably late) ended up landing at 20:50, just 15 minutes shy of the last flight BD92 (the inbetween BD96 having been cancelled). And a good half hour after my wife had left the launch and headed home. So I can't tell you what nice things Glenn Patterson said about David Park. Nor can John Self over at The Asylum tell you what I look like ... for once again, we didn't get to meet. But when I got home, we do seem to have the David Park back collection to show for the evening's entertainment - a most convenient way of me continuing not to buy any books during lent! I'd also like to be able to tell you that I've managed to get a second key for my car. But I can't. Having arranged (twice) for the car's tax book to be faxed through to Agnews so that Mercedes would issue them with the proper key and barrel, I popped in on Monday morning, determined to sit it out while they programmed the new key. It started well and I kept getting progress reports as I sat typing away drinking pots of tea and munching the exceedingly good pastries. The second key had been paired to the car. They'd requested the security codes from Mercedes. In the queue, waiting them to be returned. There was even the dangle of a key ... but not for my car. Instead for a courtesy car, since after nearly four hours, the second key wasn't yet working. The first three of the six codes that are required had been accepted by the ZX80-powered computer system that seems to inhabit the inner bowels of the Smart. But the last three codes had crashed it, locking the workshop out. So rather than continue to wait, it was recommended I take their car - a proper, red Smart fortwo - and go over to work and await a call. Sounded reasonably since I'd now drained both laptop batteries ... though I did wonder at the time why they didn't just drive me across or pop me in a taxi like they do with other people. Burning up the Boucher Road in first gear, I worked out that the automatic gear switching wasn't on this model, and slowly retrained my left hand to change gear, even in the absence of a clutch pedal to stab. And then the call came at half four. "The traffic around here isn't good ... You said you're away in England tomorrow? ... We're still working on the codes ... Might not be finished tonight ... Better bring our car back on Wednesday morning." 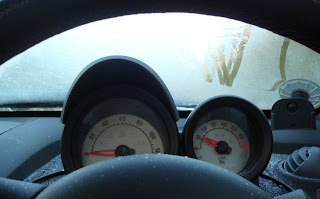 So I woke up this morning, with my overcoat, de-icer and windscreen scraper all safely locked in my car over at Boucher Road, and a heavy layer of ice covering needing to be removed at quarter to six so I could get around for the only bmi flight to leave Belfast City on time today. The gestation period of most books is probably closer to that of an elephant than a child! So an author could have a great idea that is sadly overtaken by events and diminished by the time it’s edited, proofed, published and distributed to high-street bookstores and online retailers. David Park has struck it lucky. Northern Ireland is sitting at the painted give way line waiting to drive out onto the roundabout of dealing with our past. Yet everyone is wondering what exit to take, what road we should journey down to try to uncover the truth behind events in the conflict. Indeed, some are wondering whether to go all the way around the roundabout and just head home along the road in which we came. The Bradley/Eames commission have finished their round of public consultations and are now locked away in a quieter period of reflection. In parallel, society continues to review what it actually knows about its past and how much it’s willing to find out. So much like Truth in Translation’s visit to the Lyric Theatre as part of last year’s Belfast Festival, it is a good moment to be reading David Park’s latest novel The Truth Commissioner as it rehearses one of the possible ways forward. After an introductory opening chapter, the novel switches to four equally balanced pen pictures of the main characters. The reader spends a few days with each, learning about their story and motivation through how they conduct their relationships and the odd mental aside. Glimpses into fascinating and complicated lives. Henry Stanfield is one of the six Truth Commissioners trying to sort out his own sad and lonely life as well as unpicking the history of the conflict. Francis Gilroy is a veteran of prison and now nicknamed the Lemonade Man - the minister for Children and Culture (rather than the better known local C&C producers of fizzy drinks, Cantrell and Cochrane). He juggles community justice, weddings, poor health and a continued emphasis on his personal (in)security. With Irish roots, Danny has made his home in America, finding love with Ramona in the shadow of the local university campus, feeling loyalty for the unjustly accused while harbouring mental anguish that won’t go away. And the hill-walking James Fenton is glad to be out off the police, and wants to enjoy his retirement. Readers from outside Northern Ireland will enjoy the story. But I think the plot will strongly resonate with local readers, who will pick up on the fragments of Northern Ireland’s past that are being uncovered and destabilised. Informers, the Disappeared, bugging, securocrats. The local detail is fascinating. Using the Harland and Woolf (Titanic) drawing office as the commission’s document archive felt so appropriate for a fated process that could be perhaps more crash’n’burn than iceberg-smitten. There are countless observations in the book that I’m sure are more factual than fiction. A bit like Glenn Patterson’s That Which Was which definitely had clerical input into its portrayal of a Presbyterian Minister, I wonder who snitched on the tea ladies up at Stormont who in the book are from the local Protestant estates and “probably still think of him [the nationalist Lemonade Man] as the Antichrist”. Secretly reading poetry to overcome his literary weakness sounds like a couple of actors in the current Stormont Executive! Though would the driver of a Stormont minister not have avoided McDonald’s drive-though in preference for the award-winning (and closer) Golden Chip? It’s when the four characters come together in the well-paced final section of the novel that the best laid plans of the each stakeholder in the truth process come unstuck. The book asks questions about truth. What it is? And at what price? Democracy and devolved government has a value that the state feels is greater than one family’s quest for truth about teenager’s Connor Walshe’s disappearance and fate. They can pressure the vulnerable commissioner, while the IRA have no wish to muddy the reputation of the minister for Children and Culture and can arrange for someone else to take the rap. The Police Federation can offer to help coach a former officer to tell the bare truth and nothing but the bare truth. And as long as everyone is seen to have told the truth, the amnesty will apply and no witness will have to suffer for their abbreviated truth. But like water through the underground walls of a Grand Designs’ basement, the truth has a way of finding its way through artificial barriers. I wonder after a period of conflict, so physical and visceral, whether mere words and verbal explanation would actually bring closure to the questions, hurts and injustices of the past? And would the wholesale participation and involvement of the conflict’s original players not so undermine their current reputations and livelihoods that the amnesty from prosecution would not even begin to cover the trouble and suffering they’d bring on themselves by revealing their part in the dark deeds of the past? Resetting the scales to tilt back in the favour of the victims and their families is an admirable objective, but fulsome participation is unlikely when the social consequences are taken into consideration? It’s a great book. A book of this time and of this place. Available in bookshops already, The Truth Commissioner is being launched in The Linen Hall Library tomorrow night. Well worth reading for the story, as well as the ideas we’ll be encountering over the next couple of years. And a big thank you to AiB blog-reader David Park who volunteered to send me a copy quite out of the blue. Welcome to Belfast small ads! Two opportunities for you to show off your skills and knowledge. Apple have listed some vacancies for their soon-to-open Belfast Apple Store over on their UK jobs page. (You have to search a click on the job roles before it allows you to search for Belfast.) Update - opens Saturday 20 September at 9am Update - review of the opening. The TV quiz Mastermind have been holding open auditions in Belfast today, and are continuing to search for future occupants of their famous black chair tomorrow. So if you're interested, call in the BBC Blackstaff building on Great Victoria Street,Belfast. Just turn up with four ideas for your specialist subjects. They're open on Tuesday from 10am until 4pm. The 2008 Irish Blog Awards bandwagon continues to roll towards the Alexander Hotel in Dublin on March 1st, with the short-lists announced today. Alan in Belfast managed to stay in the running for the Best News/Current Affairs Blog category (whittled down from 15 to 9 contenders), but fell short of the mark for other long-listed categories: Best Blog, Best Arts & Culture Blog and Best Personal Blog. Great to see lots of other local faces shortlisted ... many congratulations to all concerned. Two very different blogs - Just Add Eggs Ruth’s Kitchen Experiments and Manuel's Well done fillet - battling it out for Best Food and Drink Blog. Only equalled in the mid 90s by Airwolf for Saturday afternoon viewing, it was a maritime version of Star Trek, set in a high-tech submarine, but with similar geo-political storylines and a particularly intelligent dolphin named Darwin. The third series morphed the name into SeaQuest 2032 and sunk without trace was abruptly cancelled mid-season. 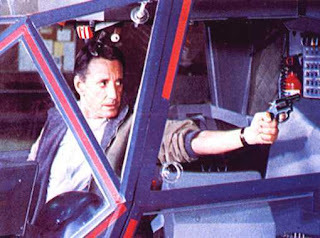 And before that Scheider had popped up playing Frank Murphy, a Vietnam veteran and now police helicopter pilot in the film Blue Thunder. 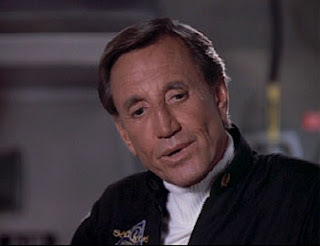 Based around the futuristic (ie, boxy) LAPD surveillance and attack helicopter, the film spawned a spin-off TV series of the same name which didn’t feature Scheider. I feel a comparative post coming on to look at Blue Thunder, Street Hawk and Knight Rider as well as a look back at a strange fascination with the low-quality, stock-footage-reusing Airwolf. You should take a look at Lori's Northern Ireland Confidential blog. The reflections of someone arriving in Northern Ireland from Nashville - great fun to read, and full of insight. 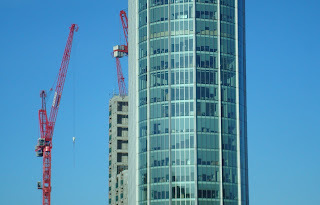 Modern architecture uses lots and lots of glass, particularly in tower blocks. A side effect are the wonderful reflections that the acres of plate glass allow. 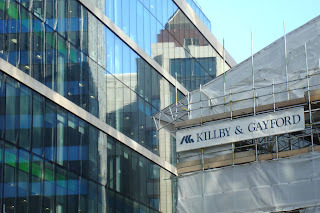 Some shots from earlier in the week around Moorgate. 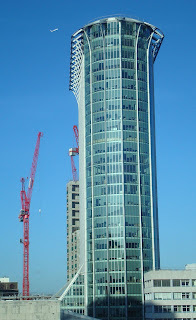 And I wonder who got the contract for making and fitting the window blinds, which seem so uniform when viewed across so many floors. If only they could be remote controlled, you could play a great game of Tetris.